Three second-year high school football players are currently on the radar of the Mitakihara Magi football coaching staff. They are left end Shintarou Okabe, right end Dakota Okabe, and left outside linebacker Takuto Shidou Itsuka. All three plan to major in kinesiology in college and have made the Mitakihara Secondary School Honor Roll. Last year, the "Three Amigos," as they are known on campus, led the MitSS Angels to the provincial title, their 30th to date. Two football moms are stumping for their boys. Tohka Yatogami, T.K. 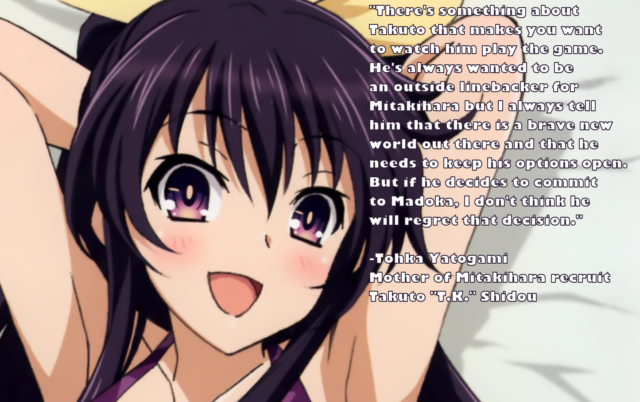 's mother, is a marketing consultant while Kotori Itsuka, the mother of Shintarou and Dakota, is a member of the Mitakihara University Staff and is the wife of defensive coordinator Buntarou Okabe. "What can I say? What do you want me to say? There's something about Takuto that makes you want to watch him play the game," Yatogami said at her job in midtown M-Town. "He's always wanted to be an outside linebacker for Mitakihara but I always tell him that there is a brave new world out there and that he needs to keep his options open. "But if he decides to commit to Madoka, I don't think he will regret that decision. Turning down the best team for years is pretty risky and it would be a safe bet that he's looking for a swell deal with the Magi. It's my alma mater too and it's Shidou's as well, so that also has to be considered." "I have two wonderful sons: Shintarou and Dakota, and both of them play defensive end," said Itsuka from her administrative office at Kaname Hall. "They're my pride and join. Shin plays on the left side, and Dak plays on the right. They have had a lot of sacks between them; I think they have 42 combined so far and that's with MitSS. They have the speed that my husband was famous for, but now they have my meanstreak that I was born with. "They have high expectations for themselves, and everybody wants them. I'd like my sons to follow their father and be coached by him, but you all know that things like that are easier said than done. It will be a major coup for any program that takes them. Keep an eye out for the new guys, they are looking to shine bright like diamonds."